Creating the space for mindful reflection at work fosters the skills that are considered highly critical in the business world in order to be successful. Digital Mindfulness Podcast: Creating a Mindful Business. Lawrence Ampofo, a thought leader on the impact of digital technologies on humans and society, interviews Joe Burton, CEO of Whil.com, Jim Gimian, co-Founder of Mindful Magazine and Mindful.org, and Erick Randolph, producer of the Mindful Business Conference in New York. Lawrence Ampofo: Lay people are kind of afraid of mindfulness and the whole culture behind mindfulness. And a lot of people are really afraid of the fact that it’s going to take a lot of their time to get into a practice. I’m wondering if you could share, why is mindfulness, especially for professionals, an important practice to cultivate? Joe Burton: I had the exact same fears as someone who’s spent his entire career working inside a public company. I was very concerned that mindfulness, and getting into a meditation practice, was sort of “hippie-dippy,” or would somehow cause me to lose my edge. And what I found was the exact opposite. For me, it was really the science of mindfulness and the data behind all of the clinical trials and research and studies correlating mindfulness with a wide array of health and performance benefits. And when I initially got into a practice, I’d say it probably took me about two or three months until things really started to click, I started to see improvements in my relationships and my sleep, and the issues I was having with back pain. But I had to get through that “oh no! It’s going to be hippy dippy” aspect. What I found is you can find different flavors of mindfulness and different types of trainers. And, you know our focus is truly on the secular side of things, but you can also find trainers who are interested in the spiritual side of things. But actually trying it, and the science, is what got me over the initial hurdle to find out it’s not a big concern for professionals. Jim Gimian: I’d add to that excellent overview that, as the field is developing, those presenting mindfulness applications for busy professionals are finding very creative ways to integrate it into what folks are already doing. I mean, the great fear is who has time to add yet another discipline or practice or something you have to make a considerable time commitment to? But we see, almost every week, new ways that these practices are woven into meetings, for example, where people are hassled about going to meetings, hassled about leaving their phones unattended during the meetings, and by the time the meeting is halfway over they are already starting to think about the next meeting. And consequently, you have five people or seven people around a circle, none of whom have actually been present and attended to the work at hand. So, it’s not really very productive. So, now many, many places are instituting a moment of quiet reflection at the beginning of a meeting. Giving people the opportunity to gather themselves, and bring their full attention and creativity to the point at hand. And so, therefore, that meeting is much more effective and productive and you don’t have as many bits and pieces left over after you spent the time. And you can then move on to the next item of business. So, in the end, short applications wind up being timesavers to greater effectiveness, bringing attention to the matter at hand. Erick Randolph: Well, the two experts have spoken, but I’ll echo much of what was said, but also chime in that during our production process for this conference we went out and we interviewed about 150 people at different corporations all across the country and in some cases around the world. Much of what we heard was that mindfulness has garnered enough attention that it’s moved from being very fringe and and kind of dangerous, to know just sort of odd, and it’s on its way to becoming mainstream. So, the conversation is less about telling people that mindfulness exists but rather demonstrating the research that is growing by leaps and bounds every year, of the positive impact that mindfulness can have in the various elements of your life in general, but also specifically in your business life. The way that it can, and I always couch this as “can impact,” it’s very important not to draw any direct causal links, that it can affect your attention, and it can affect your conversations, your interactions, your interpersonal skills. It can affect your performance or your reactions to feedback, and your ability to lead. All of these things are skills that are identified as highly critical in the business world in order to be successful. 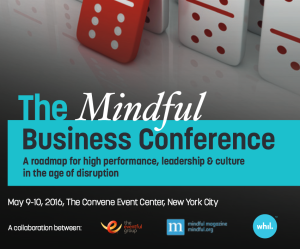 The Mindful Business Conference which runs from May 9th to the 10th, in New York City at the Convene Conference Center. The Mindful Business Conference, a collaboration between Mindful, Whil and The Eventful Group, will unite a vibrant community of business professionals to learn how mindful practices can drive peak performance, greater innovation, effective leadership, and a stronger workplace culture. Join us this May 9-10 at the Convene Conference Center in New York City. Register with promo code MindfulMagazine16 to receive 20% off the standard rate.